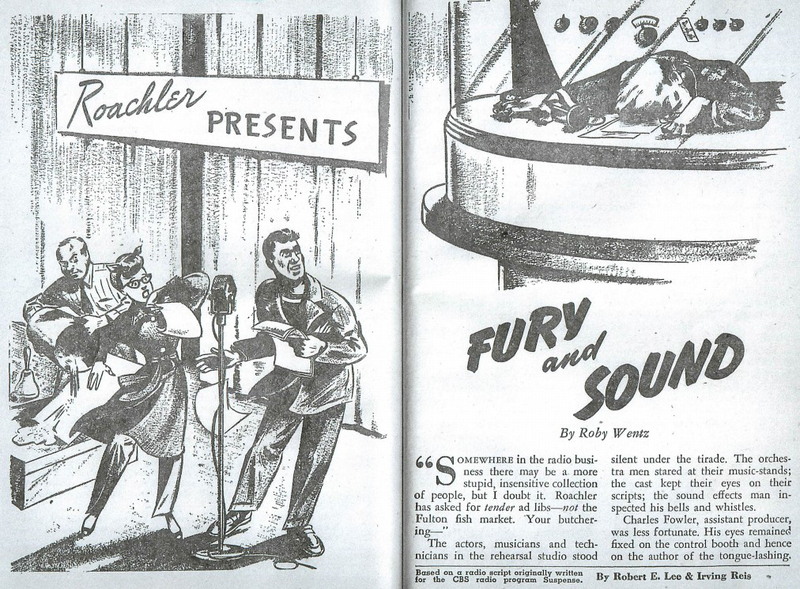 An illustration from Suspense Magazine based on the lost episode Fury and Sound. Suspense was a show that encompassed a number of genres. Most commonly, episodes fell into the categories of crime drama, mystery, or supernatural thriller. The show was also an anthology, featuring a rotating cast of characters and voice actors. Notable guest stars include Lucille Ball, Orson Welles, and Ronald Reagan. During the show's more than twenty-year run (June 17, 1942 — September 30, 1962), it accumulated approximately 950 episodes. A small number of these broadcasts have evidently never surfaced online. Some of the missing Suspense broadcasts include stories that were performed more than one time. Among collectors, these airings are given lower priority than lost episodes that were only performed once. The following list is of lost Suspense episodes that were only performed and aired once. 42/7/1 Life of Nellie James Script reportedly acquired. 42/7/8 Rope Script reportedly acquired. 42/7/15 Westbound Limited Script reportedly acquired. 43/2/9 The Hangman Won't Wait First half of show exists, and script reportedly acquired. 43/2/23 Will You Walk into My Parlor? First half of show exists, and script reportedly acquired. 43/3/9 The Phantom Archer Script reportedly acquired. 43/7/26 Fury and Sound AFRS transcription sold on eBay, and script acquired. 46/2/28 The Keenest Edge Script reportedly acquired. 48/7/8 The Last Chance Script reportedly acquired. 50/6/15 Deadline Script reportedly acquired. 51/11/12 Mission of the Betta Script reportedly acquired. 56/1/3 The Eavesdropper Script reportedly acquired. 56/8/1 Massacre at Little Big Horn Script cover page reportedly acquired. The dates, titles, and notes featured above were based on lists compiled by Dr. Joseph Webb. Webb has also created a digital spreadsheet detailing all of the missing recordings for the series, including episodes that were reperformed. A number of episodes (such as "Fresh Air, Sunshine, and Murder" (May 24, 1951), "Trials of Thomas Shaw" (November 5, 1951), and "Misfortune in Pearls" (November 26, 1951)) were initially thought to be lost one-offs, but they were actually reperformed under different titles at later dates. Respectively, they became: "Rub Down & Out" (July 6, 1958), "Once a Murderer" (November 15, 1955), and "End of the String" (January 17, 1956). At one time, "Third Eye" was thought to be a lost episode, but no episode by this title was ever aired. The episode was actually called "Finishing School" and was never lost. According to Dr. Joseph Webb, the lost episodes from the summer of 1942 may no longer exist. During the summer of 1942, the show was produced in New York, and New York's system for archiving radio was far worse than Hollywood's. Consequently, the lost 1942 broadcasts may have been destroyed. It's also possible that they were simply never recorded. Many of the episodes produced in California were archived through the Armed Forces Radio Service (AFRS, later becoming AFRTS to include television). This program recorded broadcasts, stored episodes on discs, and distributed copies of them. As a result, AFRS transcriptions of Suspense have shown up in numerous places around the world. The lost episode "Fury and Sound" was confirmed to exist in AFRS format when it showed up on eBay, but this disc was purchased by a private collector. Lastly, it's possible that home recordings for any of the lost episodes could exist. Though, the process of home recording was somewhat expensive at the time, making the practice relatively uncommon. The Wikipedia page on Suspense. A Facebook page for The Old Time Radio Researchers.